Puerto Iguazú is a frontier city in the province of Misiones, Argentina. With a population of 82,227 (2010 census [INDEC]), it is the fourth largest city in the Province, after Posadas, Oberá, and Eldorado. 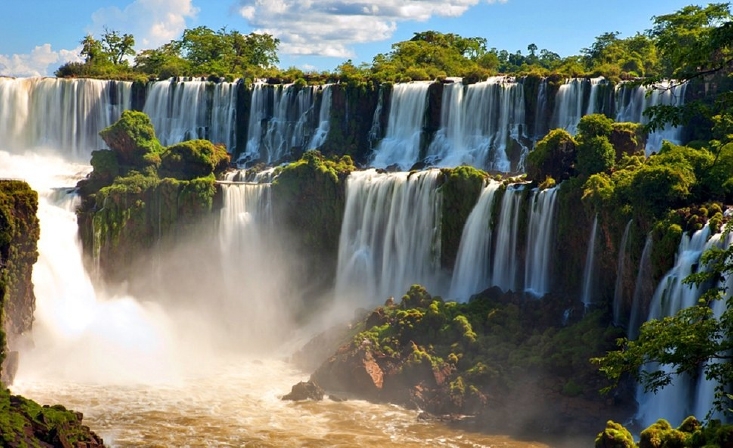 The world-renowned Iguazú Falls are only 18 kilometres (11 mi) away from the city, and as a result the city has developed much of its infrastructure around tourism. One of the last remnants of the Atlantic Forest remains in and around the Iguazu Falls. This is a subtropical forest with native bamboos and a rich diversity of birds including toucans and hummingbirds. Coatis are accustomed to begging for food from park visitors. Most of the streets of Puerto Iguazu are unmetalled, red dirt, with gutters on either side (canalitos) that have grassy banks in which eels and a variety of freshwater fish, including knifefish (gymnotus) and catfish, inhabit. The canals drain into the Paraná River.